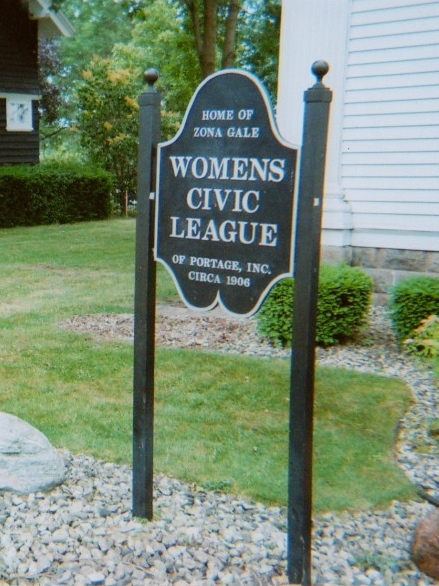 Welcome to the Women’s Civic League of Portage, Inc. Since 1931, women in and around Portage, Wisconsin, have met regularly to combine their common interests to support community causes, and simultaneously worked to preserve a part of our area history - the Zona Gale home on the Wisconsin River. Born in an age when it was unusual for women to be progressive and nurtured through the Depression years, into the ‘50s, the Women’s Civic League today remains an active, viable women’s civic organization in the 21st Century! Has it changed through the years? Of course! To remain solid, any group needs to grow with the times and meet new challenges. Check out our history under the “About” tab; meet our original benefactor, the author Zona Gale; see the remarkable Wisconsin River shoreline restoration recently completed at the Civic League Club House. Then, visit us for lunch and an interesting program (Click on the “Calendar” tab). If you are a woman living in or around Portage – we invite you to join the Civic League!